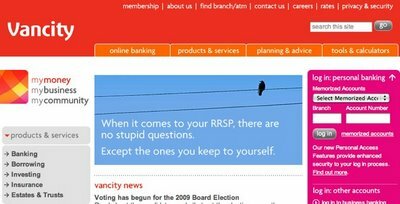 Welcome to the new vancity.com. 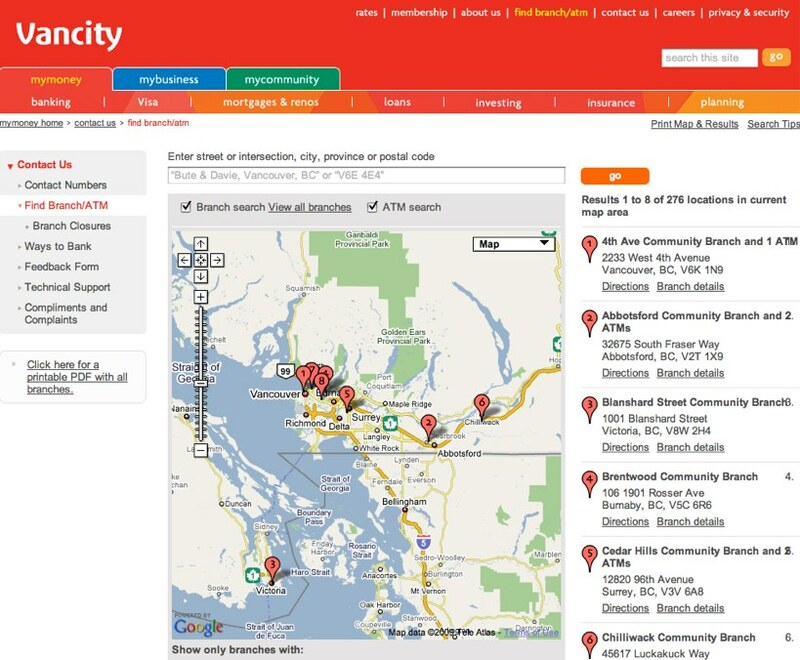 I am so happy to launch the new look of vancity.com today! This was truly a team effort: Julie, our recently-departed designer, did an amazing job; Wendy, our usability expert and project manager, shepherded the project through usability testing and led the team wonderfully; and Roberto, one of the newest Canadians, expertly managed a lot of the content and big fixes. Our extended team at Central 1 did all the front end development and did a great job. 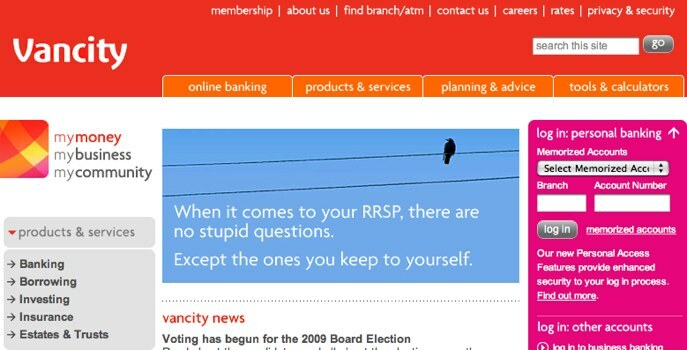 It’s truly an honour to work with Vancity’s WEB Team (WEB stands for Web Engagement & Banking)! I already blogged about why we made the changes, so I won’t repeat myself here. 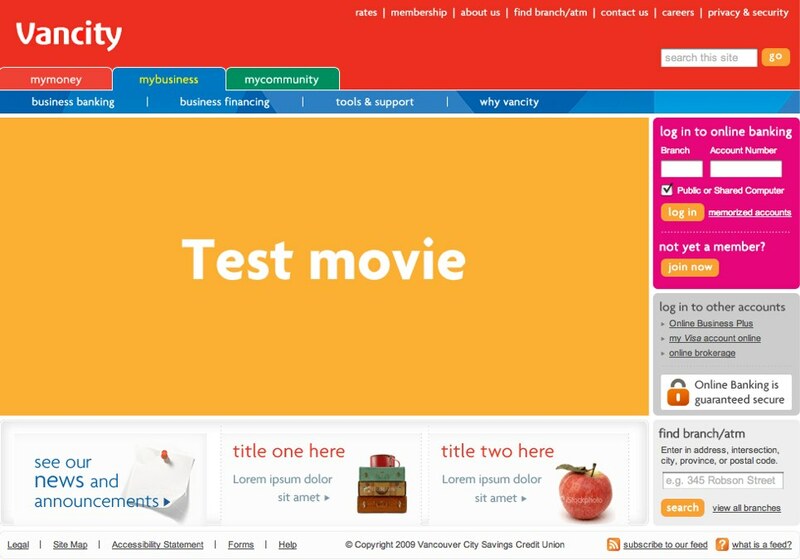 For as long as I’ve been at Vancity, which is three and half years, I’ve been wanting to redesign our main website. We have some amazingly talented people at Vancity, including Julie our graphic designer. She has taken our current visual style and adapted it, bringing it up to a more appealing look. We didn’t want to give it a massive redesign, as the site basically works, and we didn’t want to jar our members too much. On our current site below, our site navigation has always struck me as odd. We are one of those FIs who lump all of our products and services under the tab “products & services”. How many people think of themselves as buying a financial product or service? People need a new savings account or a loan or a credit card. 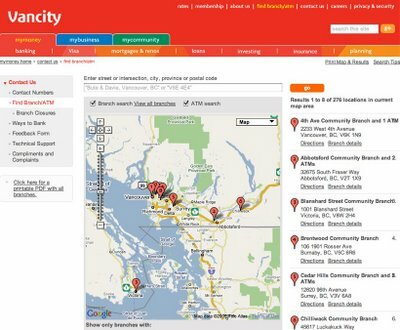 In a Forrester review of vancity.com in 2006, they pointed out that we needed easier ways to get site visitors straight to a product. So we added the Quick Links below to achieve this. When we added these links, I was skeptical they would do much. But a great percentage of the traffic hitting our main Visa page comes from this one link on our homepage. So obviously Forrester knows more than I do. We changed the navigation so it reflects both our in-branch product literature, as well as the main products people navigate to on our website. The goal was to create a simple, attractive homepage that better reflects our brand graphic standards in offline media. We brought the site to 1024×768 because over the last two years we have seen the percentage of our site visitors who have a monitor sized at 800×600 or less shrink from about 20% of site traffic to under 5% today. We also took this opportunity to upgrade the security certificate to EV SSL, so people on newer versions of IE and Firefox see the green bar in their browser bar when they come to the site, assuring them it is authentic and not a phishing site. Here are some screenshots of the homepage and our new ATM/Branch Locator with Google Maps integration (click on them to a see a bigger version). What do you think? The majority of site visitors log in to online banking, and now as they check their accounts, or pay a bill words like Banking, Loans or Investing are there clearly across the navigation. Financial products are not an impulse buy, we need to get in front of people while they are in research mode. Our new navigation should be more useful for our members as they can more easily get to information that was once obscured and is good for the company as we should see more traffic navigating through the site to valuable pages. 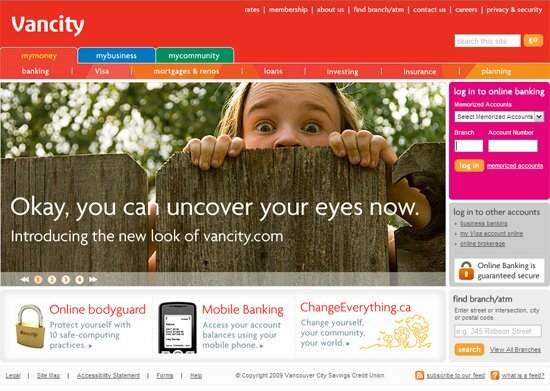 The new look of vancity.com launches April 9th. Come and check it out. 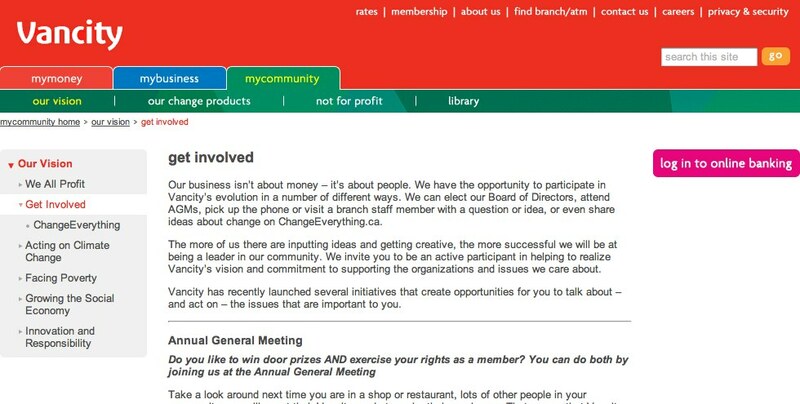 PS: Here’s a screen of the MyBusiness homepage and a MyCommunity page, as asked for by darrylh. This morning when I checked my Google Reader to see if there was any news about Vancity since yesterday, I came across a nice little surprise. An article in one of Canada’s top national daily papers, the Globe & Mail had an article entitled TD rides customer service strategy to top of online survey ranking. The article is about a recent analysis by Surviscor of the top Online Banking sites in Canada. 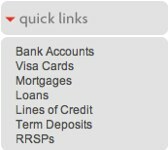 I was so pleased to see Vancity ranked number four, nestled in between our top national banks, who can outspend us like crazy. Vancity proved that they can play with the big boys in terms of offering a good online banking product, relative to the other Canadian banks. The online offering offers customers the basic features and functionality but does lack the additional features required to enhance the online experience. There is still room for improvement as its score suggests. Fair enough. Happy we’re meeting the basics, and it’s true that we don’t offer all the things the big guys do. But I’m working on it, and hopefully the next time this is run we score better and even better the year after that. One more thing. This absolutely proves the co-operative model. If we were left on our own to run our own online banking system, we couldn’t afford to compete with the national banks. We’d be on our own. But we’re not. Because of our partnership with Central 1 Credit Union, the credit union central covering BC and Ontario, all BC CUs come together and decide our online banking future together. We share costs and see ourselves united (well, most of the time) so that our members don’t have an inferior online service experience compared to the banks. This report shows that the model is working. Hats off to Kelly West at Central1, in so many ways this is truly his accomplishment. A few months back I met Igor Faletski, founder of Handi Mobility, a Vancouver-based company that develops mobile services and applications. They launched an extremely impressive service for TransLink, Vancouver’s transit authority, that lets you see the next five arriving buses at any given stop via SMS or iPhone. Impressive guy and company. We chatted about mobile banking, but as a credit union we get our services from Central1 Credit Union, the credit union central covering BC and Ontario. I have spent the last two days with them and my impressive peers from CUs across Canada in User Group meetings covering the future of online and mobile banking for credit unions. We are in very good hands. Their strategy around mobile banking especially is smart, forward thinking and yet also pragmatic. High marks from me. When I met with Igor, he mentioned he was developing a service he couldn’t quite talk about yet. And then last month I was at a session about mobile applications here in Vancouver, and Igor was on the panel. He unveiled a glimpse of his new service, and now it has launched. It’s called Mobify.Me, and it is an amazing application. Their initial blog post sums it up nicely. It will create a mobile friendly version of your website in a snap. For free. And then if you want extras you can pay for them. It’s a way to test a version of your site optimized for today’s mobile browsers quickly to see what it can do for you. I would think that credit unions who want to experiment optimizing their service for smart phones, but don’t know if it’s worth spending a lot of budget on it would be able to take advantage of this service and gain some excellent knowledge. If you have your web developer spend a couple of hours with the CSS this service spits out, you can make it look even better. And then it will mirror your main site. When you update content on your main website, the mobile site will automatically optimize that content for mobile browsers. Welcome to the new ChangeEverything.ca! 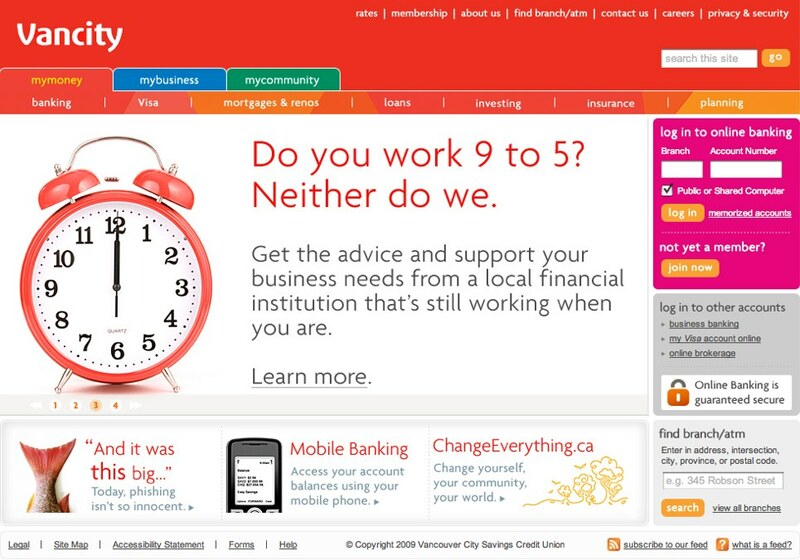 Ladies and gentlemen, I introduce you to the the brand new ChangeEverything.ca. This has been a long time in the works. Since we launched two years ago, we have identified new functionality we wanted, usability issues we wanted to resolve and design enhancements we wanted to make. With this relaunch, we got almost everything we wanted. The site revolves much more around the people now, and not just around text. It’s easier to use. And it’s pretty too. This project would not have been possible without Kate Dugas, who has animated this community in an amazing way. This relaunch is a testament to her vision of what our community could be. I want to thank Currency Marketing for designing such an amazing site. And Affinity Bridge, an amazing development shop that understands how to harness technology to build community.